This Tutorial describes how to make a simple weapon a an universal weapon mod. The mod will replace the weapon, assign it to all inventory stations, add it to every armour class, replace it in loadouts and in loadout-profiles. In the defaultproperties you just have to define the old and new weapon-class and the quantity of ammo. After you downloaded and set up UCC, you can start making the first mod. Skills in other programming language are recommended! To make your own package, create a directory named like the package-name in [TVDir]\source\Game (dont use special characters or spaces!). In this Tutorial we name our package 'MyPackage'. So we create a dir named 'MyPackage' and inside this, we create another dir called 'Classes'. Here we can put all our script-files with the extension '.uc'. Now we need a script-editor. You can use Notepad, but there are better ones like Notepad++ (that I use) or WOTgreal, a integrated development environment for UnrealScript. Inside the '[TVDir]\source\Game\MyPackage\Classes'-dir create a new file named 'MyMutator.uc', that is our first class. The keyword 'class' has to be followed by the class name (must be the same like the filename). Then you have to define which class is extended by the new class. In this case it is 'Gameplay.Mutator' because we find the class 'Mutator', that is the basic class for all mutators, in the package 'Gameplay'. For more information about Class Syntax, see http://wiki.beyondunreal.com/wiki/Class_Syntax. oldWeaponClassName is the name of the old weapon-class, oldWeaponClass is the class-handle for the weapon (the mutator loads the class named like 'oldWeaponClassName' and stores it's handle into oldWeaponClass). Because this is a wepon mod, the class-type is 'Gameplay.Weapon' and we only can use child classes of the Weapon-class. It's the same thing with the following two variables, besides they are for the new weapon. The last variable contains the ammount of ammo the wepon can have. The keywords 'string', 'class' and 'int' defines what type the variables are. See http://wiki.beyondunreal.com/wiki/Variable_Syntax and http://unreal.epicgames.com/UnrealScript.htm for more information. This function replacese all weapons of the class 'oldW' with the one of 'newW' in character's ('c') profile. First we declare some variables, 'i' and 'j' are for the two iterations, the 'pp' in for the 'PlayerProfile'. We get this in the next line, where the 'profileManager' of the 'GUIController' of the 'Player' of the 'Controller' of the 'Character' 'c' gets the avtive profile for us ;-). Then we check if everything is all right, or better, we check if something is wrong. If 'pp' does not exists or 'oldW'/'newW' is empty we return nothing, so we stop the function from being executed. Because we dont want to save the changed Profiles with our new weapon (I dont think that anyone wants the server to modify his profile) we set 'bReadOnly' = true. We seach in all 'loadoutSlots' for the matching weapon and replace it with the new one. This function is executed for each actor on the map. So we have to check if the current actor's class-name is the same like oldWeaponClassName. With the function IsA we can check if this is true, but we first have to convert oldWeaponClassName from a string to the datatype name (the funtion wants a name, not a string). So if the current actor is the weapon to replace, we destroy it and replace it with the new weapon-class. If the actor's class-name is 'InventoryStationAccess' then its the access-class for all kind of inventory stations. With the for-loop we serach in the weapon-array for the oldWeaponClass and replace it with newWeaponClass. It is the same like in the invo-access: we search for the old wepon and replace it. In addition we modify the player's profile of the current character. The MutateSpawnCombatRoleClass-function is called for character-modifications. Here we have two local variables that have to be declared at the beginning of the function for the two for-loops. The first loop go through all armor-types, the second through all weapons. If a weapon-class is the same like oldWeaponClass, it is replaced with newWeaponClass and its quantity (ammunition) is set to newWeaponAmmoQuantity. To make sure that all player-profiles are modfied, we call our 'ModifyPlayerProfile'-function again. In the defaultproperties-section you can give all declared variable a (default)value. Here we dont use a semicolon to seperate the properties. infoString = "This is my new Spinfusor." This class is very simple: it just extends the Spinfusor and changes the default-properties. 'localizedName' is the name of the weapon, 'infoString' is shown in invo-hud when you want to add the weapon to your equipment. 'roundsPerSecond' defines how often the weapon can be fired in a second. 'ammoCount' is the amount of ammon and 'ammoUsage' the usage of ammo per shot. projectileVelocity is self-explanatory. 'projectileInheritedVelFactor' is the factor the character's velocity is multiplied with, before adding it to the projectileVelocity. 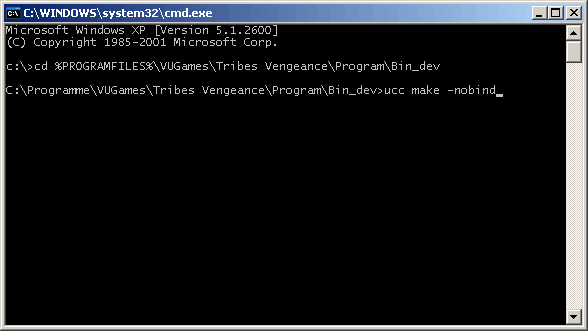 Now, carefully take a look into '[TVDir]\Program\Bin_dev', where you should find the file 'MyPackage.u'. This is our compiled code! Copy the file to '[TVDir]\Program\Bin'.